Field Location: Dinosaur National Monument. Geologic Feature: Tilted strata along the north side of Split Mountain. Necessary Background Information: Stratigraphy of Dinosaur National Park. Geologic Problem: Construct a geologic map of formations encountered along the Desert Voices and Sounds of Silence nature trails. Rock Units Exposed: Permian Weber Sandstone to Cretaceous Frontier Formation. Skills: Identification of different geologic formations in the field. Use of a brunton to take attitudes of bedding and paleocurrent directions. Ability to accurately determine and plot locations on a map. Other Questions to Consider: 1) How does the nature trail's course relate to the geology of the area? Did the trail planners consider the geology when building this trail? 2) Try to use both triangulation and pacing to determine your location today. Which method is faster for you? Which is easier? 3) What characteristics of the rock units encountered make it possible to distinguish them? 3) How do the formations change orientation as you move away from Split Mountain? Take at least 2 strike and dip measurements within each formation so that you can answer this question. 4) The instructors and T.A.s will be stationed along the trail at sites where exceptional features are present, and will help you describe and interpret the features. What sort of paleocurrent indicators do you see today? Where in modern environments do these features form? 5) After you complete your geologic cross section, can you make any estimate of how old Split Mountain must be? 6) How did the climate in the Dinosaur area change through time? 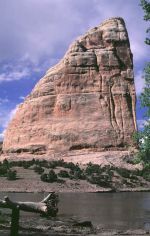 How did it differ from the climate in the Canyonlands region? 7) Was this area closer or farther from the sea during the Pennsylvanian and Permian than the Canyonlands and Capitol Reef areas? Anticipated Outcomes: Use of topographic maps and Brunton compasses to determine location. Use of Brunton compasses to take strikes and dips. Identification of sedimentary structures. Paleocurrent measurements. Identification of contacts. Identification of different sedimentary rock types. Recognition of products of different depositional environments. Geologic map preparation. Cross section construction.